The three parallel conferences started with a Welcome Cocktail in September 23, with several food and beverages offered by the University (Transilvania University of Brasov) in the bulding of Aula. In the morning of September 24, the vice-Rector of the University, the Dean of the Department and other academic personalities addressed warm welcome speeches in the conference inviting the WSEAS to organize again its brilliant conferences in January of the 2011. Symphonic music with 10 musical instruments and opera with more than 15 actors - singers in the WSEAS Banquet in Brasov. Also, several local folklore dances and happenings. 15 actors - singers in the WSEAS Banquet in Brasov. Also, several local folklore dances and happenings. 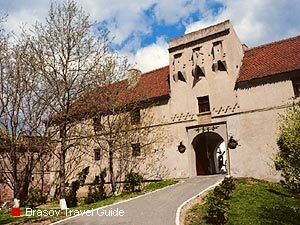 CITADEL is strategically overlooking the town and the plains to North, the Citadel is part of Brasov's outer fortification system. At first some wooden protective walls was erected here, later, in 1529, destroyed by Petru Rares. On the same spot they built a stone citadel called Cetatuia (1553), destroyed by fire in 1618 and re-built in 1625. For protective purposes the inhabitants added to the initial building four massive stone bastions in 1630. The citadel was abandoned later, after technological innovations made cannons stronger than the building. It served as a prison for a while. The Fortress or the Citadel is called in Romanian 'Cetate' (pronounced 'chetatay'), the name one should use if want to ask the locals for information about it. Most Romanians don't know the English name(s) of the place. It is not difficult to be found, as it is at the top of the hill across from the Central Park..
Before the Banquet the Administration of the Citadel welcomed the WSEAS participants explained them the historical role of the CITADEL. It was a fantastic night with live music, folklore dances and a wonderful dinner! by Prof. Constantin Volosencu, “Politehnica” University of Timisoara, ROMANIA. by Prof. Radu D. Rugescu, University Politehnica Bucharest, ROMANIA and Texas A&M University, USA. by Prof. Claudia-Georgeta Carstea, “George Baritiu” University, ROMANIA. by Assoc. Prof. Dumitru Cazacu, The University of Pitesti, ROMANIA. by Prof. Razvan Raducanu, Al. I. Cuza University, ROMANIA. by Assist. Prof. Asu Inan, Technology Gazi University, TURKEY. by Prof. Jose A. Orosa, Department of Energy and Marine Propulsion, SPAIN. by Prof. Deniz Unsalan, Piri Reis University, TURKEY.